Ever since Pantone announced colour of the year for 2018, we’ve been wanting to share ideas with you! Ultraviolet (when used correctly) is such a pretty colour. 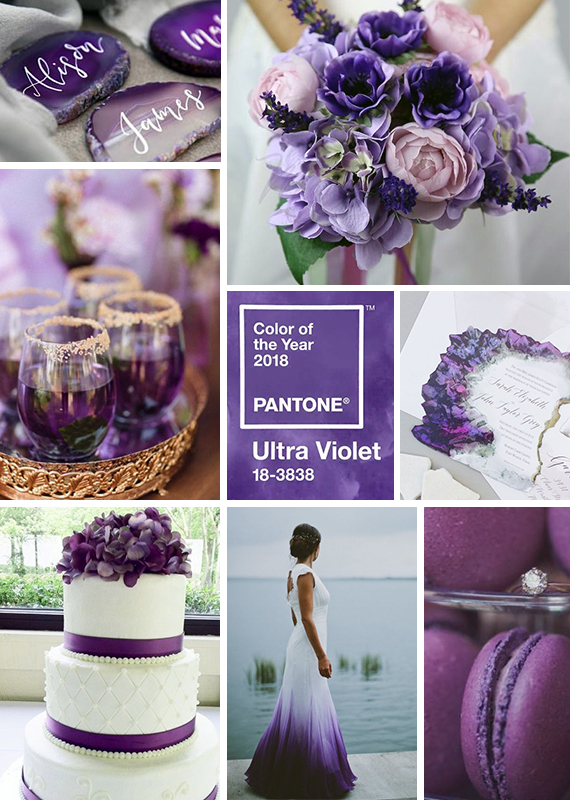 Ultraviolet can be paired with gold, grey, pastel/duck egg blue, pink, shades of other purple and more. We especially love purple (geode) crystals with this look paired with gold, this adds a touch of elegance to it that we absolutely adore! Whether you want to add subtle hints of ultraviolet to your wedding or want to go all out like the ultraviolet ombré dress below, you choose. Just be careful that you don’t overdo it as purple has the potential to look tacky sometimes, but other than that, be creative! Have fun with colour combinations, textures and flowers. Thanks for your personal marvelous posting! I seriously enjoyed reading it, you happen to be a great author. I will ensure that I bookmark your blog and definitely will come back later in life.